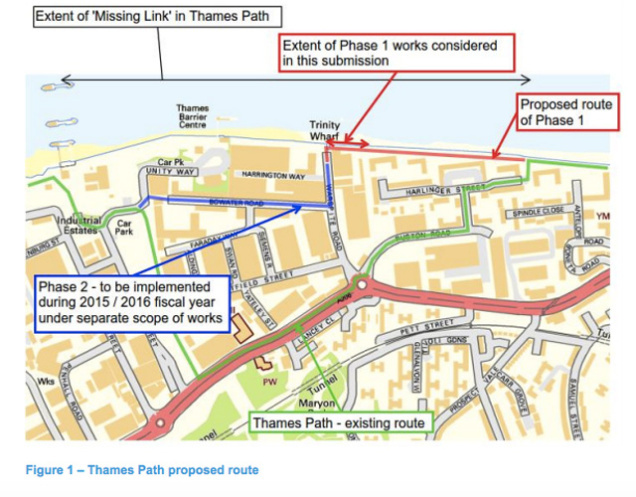 Issues around the ‘missing link’ in the Thames Path near Warspite Road have been resolved and the link is to be opened in Spring 2018. Please find an update on my activities over the period since the last newsletter. Meeting attendance has been limited due to a knee replacement in August. There was a time when August was regarded as a period of recess but lots of activity has been happening in the Town Hall. Top of the agenda and the most discussed policy issues relate to the decisions of the Planning Board and the impact these have on the lives of residents facing major housing needs. I am pleased to see that this debate is now out in the open and a change of policy is required. It cannot be right that the shortage of housing based on a social rent is not being maximised in the Borough. Councillor responsibility is to the needs of our residents rather than the aspiration of developers to maximise their profit margin and develop housing for overseas speculators. A number of planning applications are in the pipeline that must be regarded as not meeting community aspirations. Meyer Homes have now submitted their planning application for Woolwich Central Phases 3 and 4. The proposals include three new buildings (each between 9 and 16 Storeys in height). The proposals also include a twenty seven storey Tower Block in Love Lane directly in front of the Tesco Store. The Tower Block does not include any social housing. None at social rent. The proposal includes 20% of units in the new phases which is suggested as being affordable. Of course they will not be. In addition the Island Site has received planning permission with proposals for housing, retail and a cinema. The amount of social housing is derisory. More importantly, in my view, a significant level of social housing is far more important than a cinema. Indeed a cinema is included in the Spray Street proposals. The Herringham Road development is the other worrying proposal. The proposals for a 20 Storey Tower Block contrary to the Charlton Riverside Masterplan. Again the lack of social housing is self evident. It was encouraging to see how those attending the Public Exhibition spoke out in clear terms about the proposals. There are challenging times ahead but the steps taken by Mayor Khan will help to influence a change of direction for the greater good of Londoners. Council Officers have been working for some time to find solutions to resolve. Solutions have now been found and work will late October. There will be two phases to complete the work and the missing link will open in the Spring of 2018. Have your say about issues that concern you. The Woolwich / Charlton Meeting will take place at Charlton House on Wednesday 25th of October starting at 7.15pm.